So you think you can’t watch MTV content without going to mtv.com, huh? underground music and artists. The show was made as the modern-day continuation of MTV’s 120 Minutes. It normally airs on Sunday nights at 1 a.m. ET (technically Monday morning). 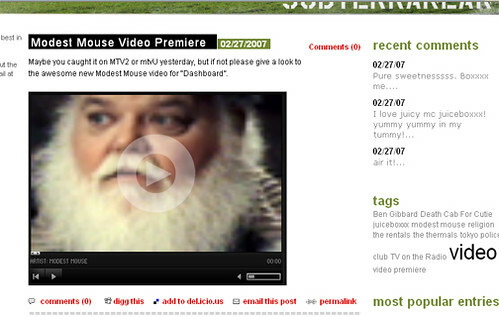 They’ve embedded a Modest Mouse video straight from Overdrive, along with many others in their blog entries! I think this is a fantastic way to *temporarily* get around the fact that we still don’t have a branded, syndicated player *yet*. … It will be nice when all MTV content can be shared. … Comedy Central’s syndicated player gets love all the time: The Digital Journal recently covered John Stewart’s cool interview with the founder of Craigslist.